Diabetes and heart health are closely connected — not only does having diabetes put you at greater risk for heart disease, but many of the same management strategies can help you avoid both diabetes- and heart-related problems. While your doctor should discuss your heart disease risk with you, many people with diabetes still don’t talk about their heart health with their doctors. There may be a number of reasons for this, including the limited time available at appointments or patients’ hesitancy to ask about the topic — possibly because they don’t know what to ask. But having a conversation about your heart disease risk is a vital step toward taking charge of your health. Here are some of the most important questions to ask your doctor about heart health, and why healthcare experts believe they’re worth asking. Do I have an elevated risk for heart disease? This question is a good way to get a conversation on the topic started, but you shouldn’t be surprised by the answer. But, Dr. Eimer adds, how high your risk for heart disease is depends on other factors besides just diabetes, including your blood pressure, blood lipid levels, weight, kidney health, family history, smoking status, and physical activity level. Overall, adults who have diabetes are two to four times as likely to die from heart disease as those who don’t have diabetes, according to the American Heart Association. But this risk can be managed and reduced with the right treatments and lifestyle habits. What heart disease risk factors can I control? Obviously, some risk factors for heart disease are beyond your control, like your family history and your personal health history. But many other risk factors can be modified. Feldman adds that it’s important to control not just your blood sugar levels but also your blood pressure, cholesterol, and triglycerides. Addressing these risk factors, she says, may require both dietary changes and medications. And if you smoke, it’s also vital to get the help you need to quit. What kinds of exercise should I be doing? No matter what your other risk factors are, it’s important to stay active. Exercise is a key ingredient, says Feldman, who urges people with diabetes to engage in both resistance and aerobic activities. What foods should I eat or avoid to help lower my heart disease risk? To lower your risk of heart disease, it’s important to pay attention to both your overall diet and to specific foods or nutrients that you should avoid. For most people, says Feldman, saturated fat, refined carbohydrates, and sodium are among the foods that can cause harm. “We strongly recommend lowering saturated fat in the diet” for most people, and particularly those with diabetes, Feldman says, adding that this type of fat is a “key factor” adding to heart disease risk. Regarding carbs, “not only the amount but the type of carbohydrate is extremely important,” she says. Whole grains, legumes (beans, peas, and lentils), and starchy vegetables should be chosen over processed foods. Regarding alcohol, Eimer says that “there seems to be a consistent benefit to one or two drinks a day in terms of reducing the risk of heart attack.” But, he adds, you’ll need to consider the effect alcohol has on your blood sugar and body weight. The big picture is also important: Follow a diet based on whole grains, healthy fats, lean sources of protein, and plentiful fruits and vegetables. Also make sure to keep portion sizes in check. How important is weight control when it comes to my heart disease risk? While maintaining a healthy body weight is a worthy goal, it may be counterproductive to focus too much on your weight, Eimer says. While following a healthy diet and getting enough exercise may help you lose weight, the effects of these habits on your blood pressure and lipid levels may be more important when it comes to your heart disease risk. In fact, Eimer says, it’s not clear that body weight is even an independent factor for risk of heart attack or dying from heart disease. 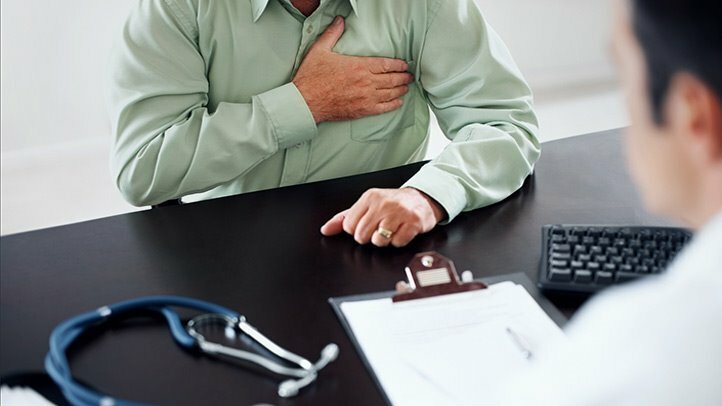 What heart disease warning signs should I look out for? Other symptoms to watch for include arm or jaw pain and sweatiness, says Eimer, although these can also be signs of many conditions unrelated to the heart. How often should I get my blood pressure and lipid levels checked? Feldman notes, however, that some doctors prefer to check lipids more frequently, possibly every few months at regular office visits. Conversely, cholesterol lowering drugs are now recommended in all diabetics irrespective of lipid levels, so some doctors may not check frequently as long as their patients are taking these medications. Do I need a cardiac stress test? During a stress test, a doctor monitors your heart rhythm, heartbeat, and blood pressure while you’re performing vigorous exercise, usually on a treadmill or stationary bicycle. Patients who can’t exercise may require a medication to simulate stress. Eimer notes that according to 2017 guidelines from the American College of Cardiology, virtually all people with diabetes over age 40 should be taking statin medications to lower their heart disease risk. So if you’re not on a statin, it’s worth asking your doctor about. But the relevant studies of GLP-1 receptor agonists and SGLT-2 inhibitors involved people at high risk for heart-related events and death, so if you’re not in this group, the drugs’ benefits may be limited, Eimer adds. It’s therefore important to work with your doctor to evaluate which treatment options may be best for you.